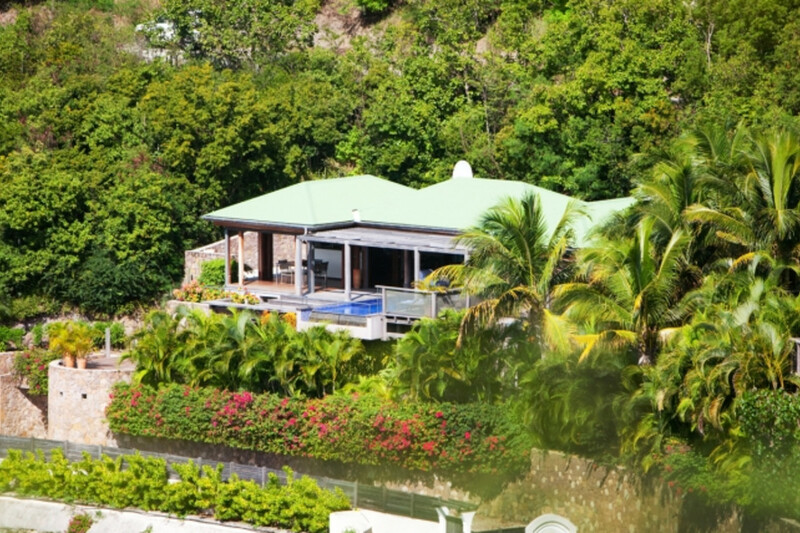 Villa Grus is a contemporary 2-bedroom villa located in Pointe Milou within minutes of several beaches and shopping. Situated high above the ocean with a panoramic western view, this villa is a superb spot to watch sunsets. The warm ambience, created by honey-colored teak and contemporary island décor, harmonizes perfectly with the tropical climate. The open living space with comfortable furnishings faces the infinity pool and ocean. The living area connects to an open, well-equipped gourmet kitchen with indoor dining table, views of the sea, and access to a barbecue grill on an adjoining terrace. A partially covered wood terrace with loungers surround the infinity pool, making the spot ideal for relaxing in the shade or sunbathing. The master bedroom is located on the main level off the living room, and offers a beautiful sea view, king-size teak bed, and en suite bathroom with outdoor shower. The second bedroom is located on the lower level and has a 4-poster king-size bed, en suite bathroom, and a private terrace with chaise lounges and view. The house also comes with air-conditioning in all bedrooms, WiFi, stereo with iPod connector, and U.S. satellite TV. Villa Samsara comes with house cleaning services six days a week, except on holidays. During the Thanksgiving and December holidays, the villa rents at the full occupancy rate regardless of how many bedrooms are used. This villa does not allow children. ###Bedroom 01 1 King Bed, Air Conditioning, Ensuite Bathroom, Screens Master with teak bed and ensuite bathroom (shower is outdoor/private). This room has a beautiful sea view and located off living room (TV/DVD player) ###Bedroom 02 1 King Bed, Air Conditioning, Ensuite Bathroom, Screens 2nd Master (located downstairs) 4 poster King, sliding doors to a private terrace with chaise lounges and ocean view. (TV/DVD/stereo). Garden Tropical garden with coconut palms and island flowers. ###Kitchen BBQ, Blender, Dishwasher, Juicer, Microwave, Nespresso Coffee Machine, Toaster Very well-equipped gourmet kitchen that opens to the dining and living room. Pretty glass dishware and access to barbecue on adjoining terrace. ###Living Room Open air living room with beautiful wood floors and a large sofa from Bali. Stunning ocean views. Very Zen. Office In a section of the living room there is an office area with fax and internet access. Terrace Terrace surrounds the pool and the living room. The deck area is made of tropical wood & stones from a Balinese river bed.